Do you have little ones who love to paint? Try these super easy Halloween rock painting ideas for kids. Get ready for a full list of fun kids crafts include finger painting, scary stickers, spooky eyes, and tradition Jack o-Lantern on rocks. These Halloween crafts are a part of another post called, 31 Days of Halloween Rocks, check it out for more spooky rock painting ideas. 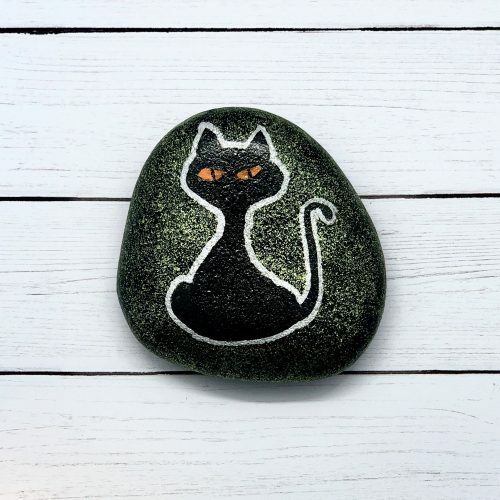 Now, just like when preparing your witch’s brew, you will need some ingredients to create these super scary Halloween rock painting ideas for kids. If you’re new to rock painting go to Start Here to get all the beginner rock painting tips and find out the best tools and supplies to use! Start by searching in your own backyard for rocks to paint. Public areas such as parks, and hiking trails are great places to find rocks. Next, it’s time to clean the rocks using soapy water to remove dust and dirt. Let them dry completely before starting the project. Have your little one begin painting a base coat of white or black on the rock and let it dry before starting the thumbprint painting. My little guy used acrylic paint for this thumbprint painting craft. Have them dip their thumb in the desired color of paint and stamp the rock. Use the paint pens to decorate the spooky rocks. Once their creepy creatures are done, let the paint dry completely before spraying the clear sealer on the rocks. Paint your rocks however you want. I had some leftover painted rocks from a Halloween paint pouring project, so I used those. 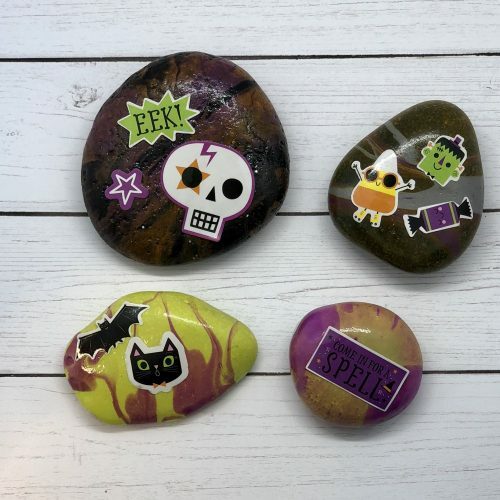 Decorate your rocks with your spooky Halloween stickers. Spray rocks with a clear sealer spray and wait 24 hours before handling the rocks. Have your little one paint a black base coat. Once it’s dry, using a pencil, draw the eyes. Using an orange paint pen, fill in the eyes area. Let it dry completely, before spraying on clear sealer. These Halloween rock painting ideas for kids, can actually for work for any skill level as well. Paint your rock with orange craft paint. Once it’s dry, using a pencil, draw the eyes, nose and mouth. Using a black paint pen, fill in the eyes, nose and mouth areas. Then make white dots in the eye area. Let it dry completely, before spraying on clear sealer. Paint your rock with black craft paint. Once it’s dry, using a pencil, Begin tracing your cat image with white tracing paper. Trace over it with a silver paint pen. Then make orange eyes with an orange paint pen. 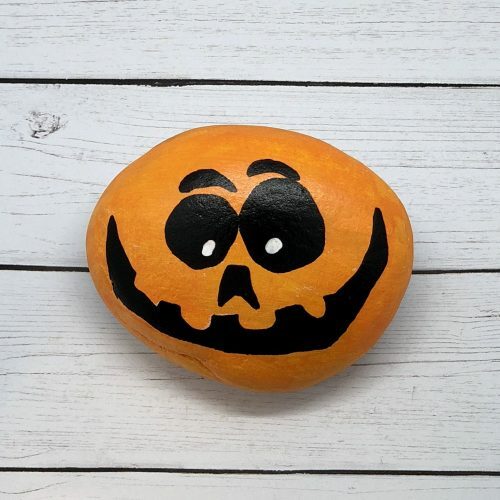 This Halloween rock painting idea for kids is a fun art project for your doodlers! My son was introduced to zentangle art last year in school and it’s becoming a very popular art technique. We had fun experimenting with different patterns and just going with the flow of things. Apply a black base coat to your rock. Draw a witch hat with a white colored pencil. Then color in the hat with a silver paint pen. We used a Micron pen and Tombow for the zentangle patterns. I love sparkle, so I added a couple layers of Extreme Glitter paint by FolkArt. My oldest son, who just became a teenager, loves to draw. This is his Frankenstein rock, that he wanted to create for this Halloween rock painting ideas for kids post. Draw an outline of Frankenstein with a white colored pencil. Then color in the face with a green paint pen. He used a black paint pen to draw the facial features and hair. Let is dry before going over the eye area and teeth with a white paint pen. Use a silver paint pen to make the bolts below the ears. If you’re a big Disney fan, then you will love these Haunted Mansion Rock Painting craft. You might have noticed while waiting in line outside to ride Disney’s Haunted Mansion ride, the spooky cemetery. Paint your tombstone with gray craft paint. While it’s still wet, brush on white craft paint lightly in some area to give it an aged looked. Research the saying you want written on the tombstone. 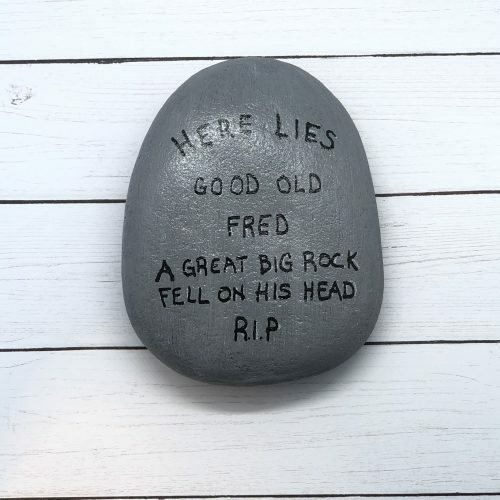 Using a steady hand, write out your message on the rock. I used my favorite, Tombow black pen. After the Haunted Mansion Tombstone Rock Painting is completely dry, spray a clear sealer on the rocks and let it dry for 24 hours. Painting a rock with a base coat will provide a vibrant tone to your design. Acrylic paint is water-based and is washable on fingers. Tempura paint is water-based and washable as well, it’s a kid-friendly paint. Read 25 Hacks Every Artist Should Know for stain removal tips. Use whatever craft paint or finger paint you have on hand will do just fine. 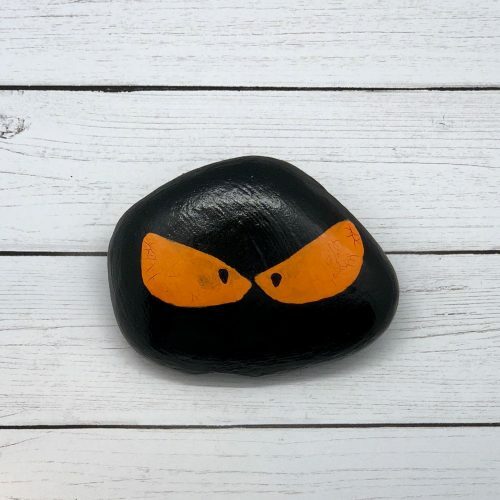 Want even more Halloween rock painting ideas for kids, check these out! 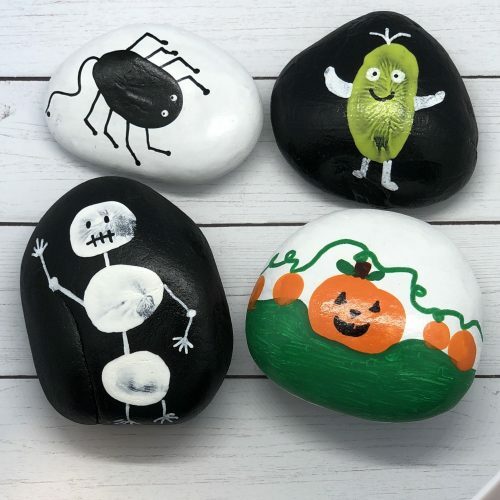 If you like these Halloween Rock Painting Ideas for kids let me know in the comments below.